An elegant solution to where you put the new MCU Spider-Man origin. I'm hearing a lot of kvetching about whether we need a Spider-Man origin story for the next reboot of the character to put him in the MCU (199999). Well, we do. We need some information. 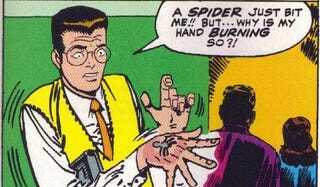 Chemical Web-Shooters or Wrist Spinnerets and all that jazz. How Ben Parker's going to get it this time. There is a character to introduce to us and let us get to know. Etc. Etc. Origin stories for stuff like this teach us how these things work. And I know most of us here are savvy enough to pick up on stuff like this. But we need it for those of us that don't speak "comic-book nerd". People unfamiliar with the tropes. And at the same time, we really don't. We really really don't. So very many of us don't want to have the first half hour of our next franchise burned up with the necessary exposition that teaches us the language of how his powers work and how great power equals great annoyance responsibility. We know this story. We can dream it accurately at the age of 4 years old and even get the dialogue right. This is something we know. Need we re-hash it one more time? Can't we get on with the story without burning 30 to 45 minutes of time to see how it happens yet again? So how about this... we have his origin happen... but we don't do it in the movie. I see I have some splaining to do. Work with me. It all starts during the fateful field trip. The one where the irradiated servant of the Spider totem in the 199999 selects Peter to become Spider's avatar. (or... NOM!! "OW!") We know Flash and MJ are there. Gwen too if you're going to go with the 616 a bit for flavor. But who else was there too? Someone getting her own show on Netflix? In the pages of Alias, She had a crush on Pete back in high school. Jessica just barely missed being Spider-Man when the little spider bit Peter instead of her just a few feet away. Later still, she just misses being Daredevil when she's on the sidewalk and some kid near her gets beaned with a cannister of ooze that fell off a truck and blinds him. So have this scene in flashback happen in her series on Netflix since we're filming now. Perfect opportunity! Here's where you do the beginning of where you introduce Peter into the MCU gradually. This series will of course be filmed and watched by 2017 when the MCU Spider-Man standalone film is released. Which is plenty of time for us to have seeded his beginnings through several street-level shows like AKA: Jessica Jones/Alias, Agents of SHIELD, Power Man & Iron Fist and The Defenders. Hell, you could even do a nice little two or three minisode internet thing to do the origin stories in. Or do them as the short subjects on the subsequent DVD releases over the next few years. The same ones that introduced us to Phil Coulson before the Avengers. And when the eventual Spider-Man MCU reboot DVD comes out, you include all the collected seed appearances of Peter Parker's origin into a coherent narrative in the extra features. There's your origin for the people that need one. And the absence of an origin in the movie for the people who need not to have one burning up valuable awesome storytime. Happy? I would be if they did this.